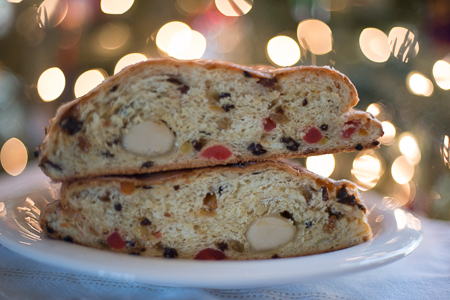 Stollen has been part of my Christmas season as long as I can remember. My mother loves it and used to buy it for Christmas breakfast any time she could find it. This wasn’t easy in those days when food from other countries was difficult to find, especially in Little Rock, Arkansas, where I spent a considerable part of my childhood. When I was younger I could take it or leave it. 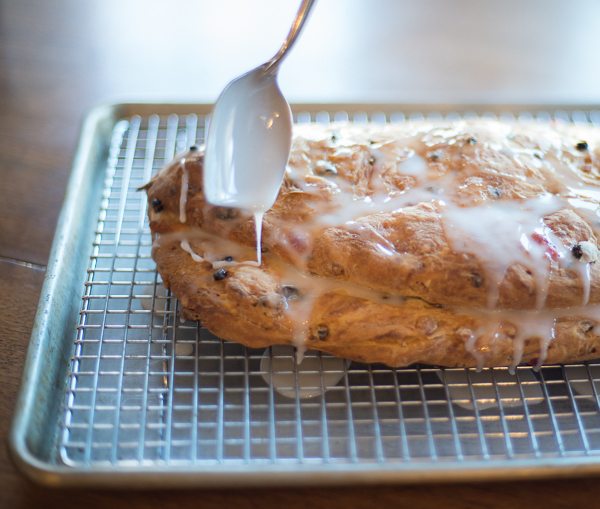 To me it wasn’t nearly as enticing as my Dad’s cranberry bread, which we only got to have once a year. But when the Army assigned me to Wiesbaden, Germany when I was 24, I experienced Christmas in a whole new way. 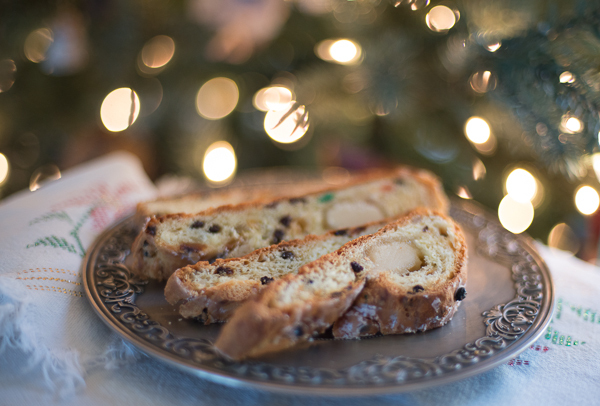 Stollen was everywhere, and I loved it. I found myself in Germany again for 2 years in 2010, this time with a husband and four pets. You know how some people say that you can never go back to a place you have been before because it will never be the same? Well that was the case with Germany at Christmas; it wasn’t the same, it was even better! Maybe it was because I had someone to share the experience with, maybe because I could appreciate it more, but I truly loved living in Germany, especially at Christmas time. There were Christmas markets everywhere, but my favorite was the Esslingen market, just outside of Stuttgart. For the Christmas market, the medieval town was lit only by candles, and it was simply magical. It could have been a movie – cue the snow, start now, carolers start singing… There we were walking along, mugs of gluhwein laced with Amaretto and cream (oh my God, so good) in hand, enjoying the snow and the sites. Two years later I still miss it. 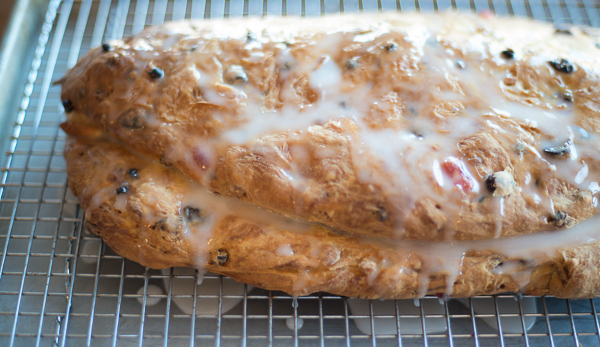 As much as I love it, my baking time is pretty limited, but when I came across a recipe for stollen in one of my Christmas cookbooks I just knew I had to make it this year. 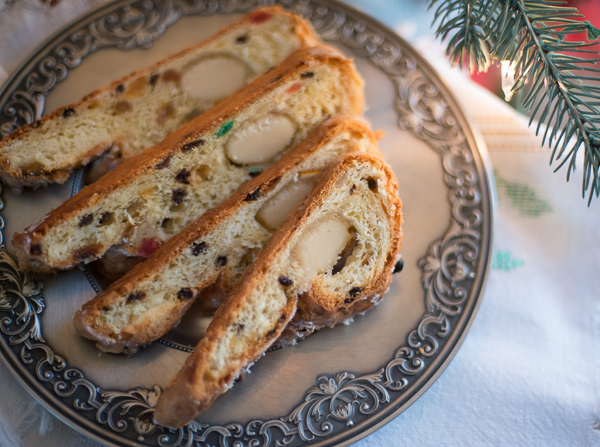 Stollen is a German yeast bread, dating from 1474 that usually contains dried fruit and nuts and is iced with a glaze or covered with powdered sugar. It’s perfect as is, warmed and spread with butter for breakfast. And, if it’s not completely devoured while it’s fresh, it’s also great toasted. As with many of my baking recipes, you will need a kitchen scale to measure out the dry ingredients. If you don’t like or can’t find marzipan you can leave it out. Just fold the dough like you would if using the marzipan and leave to rise. Another option would be to roll the marzipan out into a rectangle half as wide and as long as the dough, placing it on half of the dough and then folding it over the rectangle of marzipan. Heat the milk just until it’s warm, but still cool enough to dip your finger into it. Stir in 2 tablespoons sugar and the yeast and allow to rest until it bubbles on top. Meanwhile, sift the flour, remaining sugar, and salt together in a large mixer bowl. Add the yeast mixture, butter and eggs and mix thoroughly with a dough hook. Add in the fruits, nuts, and lemon zest and knead in mixer for 5 minutes. Remove from mixer bowl, and knead by hand until dough is springy and elastic, adding more flour if necessary. Form the dough into a large ball, place in a large empty bowl and cover with plastic wrap. Let rise in a warm draft-free place until double in size, about 1 1/2 hours. Turn the dough out onto a floured surface, punch it down and knead until smooth and elastic. Use your hands to press the dough out into a rectangle, about 10 X 8 inches. Use your hands to roll the marzipan out into a long log the length of the dough and place it in the center. Fold the dough in half lengthwise, over the marzipan log and press the edges together to prevent the marzipan from leaking out. Carefully place the bread on a baking sheet ensuring there is plenty of space. Cover loosely with plastic wrap and leave to rise until it again doubles in size. Preheat the oven to 375. Bake the bread for 35-40 minutes until golden brown. Allow bread to remain in the pan for 5 minutes, then transfer it to a rack placed in a baking sheet to cool. While the bread is baking make the glaze, by combining the lemon juice and the powdered sugar. After transferring the bread to the rack spoon the glaze over the bread while it is still warm. Allow to cool completely before cutting into slices and serving. This entry was posted in Baked Goods & Desserts, Bread and tagged Baked Goods & Desserts, Bread, breakfast, Christmas, German, Stollen by Jeannine. Bookmark the permalink.